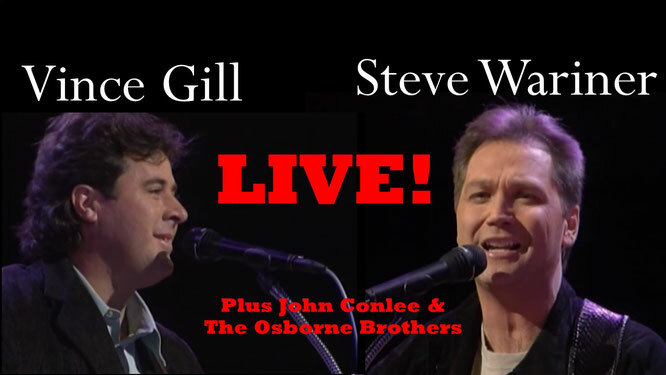 Vince Gill & Steve Wariner live! Plus John Conlee & The Osborne Brothers. Full show! - Newhillbilly website. 100% American Roots Music. Steven Noel Wariner (born December 25, 1954) is an American country music singer, songwriter and guitarist. He has released eighteen studio albums, including six on MCA Records, and three each on RCA Records, Arista Records and Capitol Records. He has also charted more than fifty singles on the Billboard country singles charts, including ten Number One hits: "All Roads Lead to You", "Some Fools Never Learn", "You Can Dream of Me", "Life's Highway", "Small Town Girl", "The Weekend", "Lynda", "Where Did I Go Wrong", and "I Got Dreams", and "What If I Said", a duet with Anita Cochran from her album Back to You. Three of his studio albums have been certified gold by the Recording Industry Association of America for shipping 500,000 copies in the United States. In addition to writing or co-writing most of his own songs, Wariner holds several writing credits for other artists, including Number One hits for Clint Black and Garth Brooks, as well as singles for Bryan White and Keith Urban. Other artists with whom he has worked include Nicolette Larson, Glen Campbell, Mark O'Connor, Asleep at the Wheel and Brad Paisley. Wariner has also won four Grammy Awards: one for Best Country Collaboration with Vocals, and three for Best Country Instrumental, the most recent in 2010 for "Producer's Medley" from the album Steve Wariner, c.g.p., My Tribute to Chet Atkins. Steve Wariner was one of only five guitar players in the world to be given the "Certified Guitar Player" (CGP) award by Chet Atkins (six including Atkins himself, the others being: John Knowles (guitarist), Paul Yandell, Jerry Reed, and Tommy Emmanuel). Wariner became a member of the Grand Ole Opry in 1996. He was inducted into the Music City Walk of Fame in Nashville in 2008, and the Kentucky Music Hall of Fame in 2011. John Conlee (born August 11, 1946) is an American country music singer. Between 1978 and 2004 Conlee charted a total of 32 singles on the Billboard Hot Country Songs charts, and recorded 11 studio albums. His singles include seven #1 hits: "Lady Lay Down," "Backside of Thirty," "Common Man," "I'm Only in It for the Love," "In My Eyes," "As Long As I'm Rockin' with You" and "Got My Heart Set on You." In addition to these, Conlee sent 14 other songs into the Top Ten.